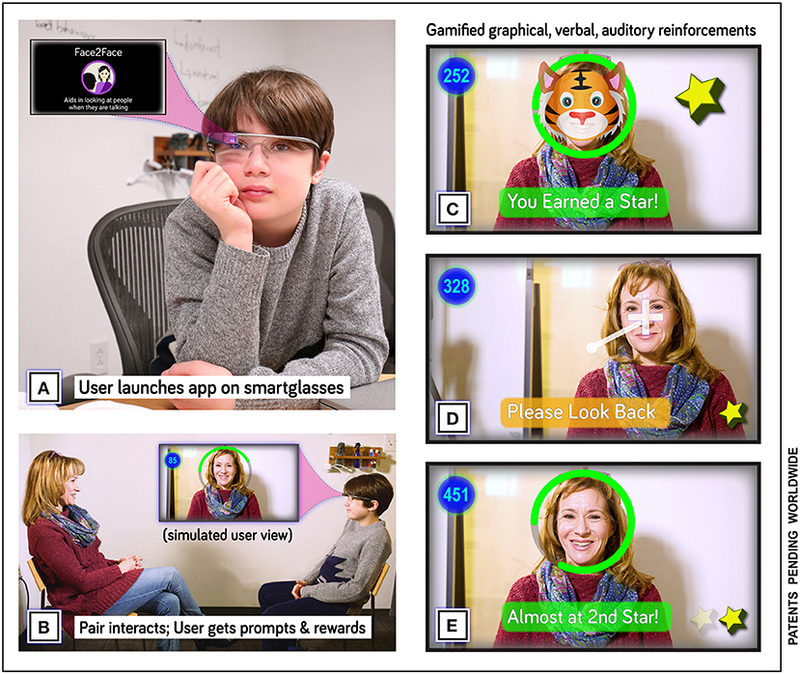 Methods: A 13-year-old fully-verbal adolescent male student with a diagnosis of ASD received a total of 16 smartglasses-aided intervention sessions over a 2-week period. Interventions occurred twice-daily during school days and were facilitated by school professionals in a middle school in Massachusetts, USA. Outcomes were measured using the Social Responsiveness Scale 2 (SRS-2), a commonly used validated measure of social communication in children with ASD, by the participant’s parent, paraprofessional, and two teachers. Difficulties in usability during the study were recorded through observation notes. Children are spending more time in school, with the length of the school day increased to ~7 h over the last few decades (Kolbe et al., 2012). With almost a third of their day being spent at school, schools have become a central part of children’s lives. Schools are not only educational establishments, but highly social environments, with many interpersonal relationships and interactions between students, teachers, and other educational professionals. 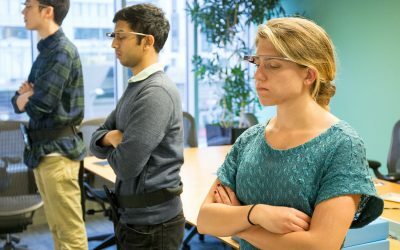 Smartglasses, like Google Glass, are head-worn computerized glasses that can transmit visual and auditory information to users through a small clear optical display(s) and bone conduction/audio speaker, respectively. Smartglasses, like smartphones, typically contain a wide variety of sensors that can collect data regarding the user’s body movements and interactions with the environment. These sensors include a camera, a microphone, an accelerometer, a gyroscope, and Wi-Fi/Bluetooth. The Empowered Brain can detect the presence of a human face, determine where a user is looking relative to that face, and help guide user’s gaze toward the face in real-time. Guidance to the user is provided through visual directional prompts and auditory tones that vary depending on the positioning of the user’s gaze and the positioning of the detected face. The Empowered Brain modules use developmentally and contextually appropriate game-like elements to make the experience engaging and fun for both child, adolescent, and adult users. For example, a cartoon-like character is optically superimposed over the face that they are being guided toward. The real-world school setting has proven itself to be a more difficult environment to provide a social communication intervention than a controlled research setting (Lawton and Kasari, 2012). Teachers and their paraprofessional colleagues may be ideal personnel to help deliver school-based communication interventions in students with ASD (Lawton and Kasari, 2012). Their intimate knowledge of a student’s strengths, weaknesses, and style of learning, combined with their established position in delivering guidance, places them in a unique position. Students’ perception of teacher support and teacher-led promotion of interaction and respect have been linked to increased student motivation and engagement (Ryan and Patrick, 2001). The study commenced with a baseline week (Week 1), during which the participant received no intervention, and had his regular school and home schedule. At the end of the week, school educators and his mother completed the SRS-2 based on the interactions and behaviors they witnessed during the baseline week. The SRS-2 was completed by three school educators: the participant’s special education teacher, general education teacher, and assigned paraprofessional. The use of cross-informant (educator and parental) ratings is the gold standard in child behavioral assessments (Dickson et al., 2017). The participant’s baseline week was the control for this report. The study then proceeded to the first intervention week (Week 2) where the participant received twice-daily Face2Faceinterventions. The intervention was facilitated by one of his school educators, during which time the participant continued to be in the classroom alongside his peers. The intervention was 10 min long and was delivered at approximately the same times each day. At the end of Week 2, following eight intervention sessions, the participant’s educators and parent each completed an SRS-2 based on the behavior seen during that week. The second intervention week (Week 3) was a duplicate of the first intervention week, and a repeat SRS-2 was completed at the end of the week. Figure 2. Study design. (A) Overall design of the 3-week study. A baseline week was followed by 2 weeks where Empowered Brain intervention was added to the interventions the school otherwise proveded. At the end of the baseline week and each Empowered Brain week, the participant was rated according to the gold-standard autism rating scale, the Social Responsiveness Scale-2nd Edition (SRS-2) (See Figure 4). SRS–2 ratings were conducted in all cases by the participant’s general education teacher, the special education teacher, paraprofessional, and the parent. (B) Design of each day of the study during the intervention period. Two 10-min intervention sessions were run daily, with a late morning session in the participant’s regularly scheduled general-education class (See Figure 3), and an afternoon session in his regularly scheduled special-education pullout class. During the Face2Face phase (Phase 2), the participant would wear the Empowered Brain and would experience the feedback coaching of the Face2Face module as he conversed with the educator. During the conversation, the Face2Facemodule monitored the level of attention the participant was directing to the educator’s face. 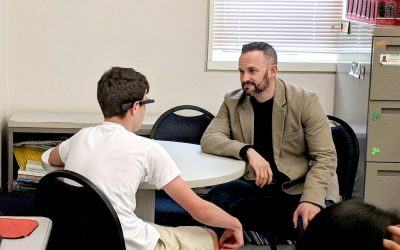 The participant could gain game-like points and AR rewards when he looked toward the educator during the conversation. If the participant looked away from the educator, he would get visual and auditory guidance to help him redirect his attention back to the educator. This study was performed in a public middle school in Massachusetts, USA. The intervention was delivered twice-daily during school days. The first session was delivered by the student’s general education teacher during the morning general education class. This classroom setting consisted of 2 educators, the general educator teacher and a paraprofessional, looking after a class of 23 students. The second daily session was delivered by the student’s special education teacher during an afternoon special education class. The special education teacher was aided by a paraprofessional in looking after the 11 students in this class. The use of the Empowered Brain running on multiple head-worn computing devices by children and adults with ASD was approved by Asentral, Inc., Institutional Review Board, an affiliate of the Commonwealth of Massachusetts Department of Public Health. The study was performed in accordance with relevant guidelines and regulations, and in accordance with the Helsinki Declaration. Written informed consent was obtained from all parents/legal guardians of all minors involved in this study. Consent to conduct this research was also obtained from all educators involved in the study. Written informed consent was obtained from the participant’s parent for the publication of their identifiable information. The baseline school week concluded with no concerns by the participant’s teachers or parent (mother). All three school educators and parent completed the baseline SRS-2 at the end of the initial week. The intervention was delivered to the participant on a total of 16 occasions over the 2-week intervention period, twice-daily during the 4 days of school in each week. School educators and the parent noted no usability or adverse effects that resulted in an intervention session being terminated early or being postponed. All three school educators and the participant’s parent completed an SRS-2 at the end of Week 2 and Week 3, following eight total intervention sessions and 16 total intervention sessions, respectively. The results of the SRS-2 ratings are outlined in Tables 1–4 (and in graphic format in Figure 4). 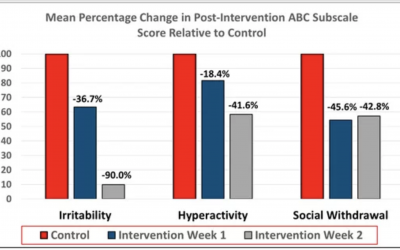 The findings of our case study demonstrate preliminary evidence that this particular autism-focused intervention, the Empowered Brain, is associated with improvements in social communication. This improvement was observed through the use of the SRS-2, a gold standard and validated social communication scale. 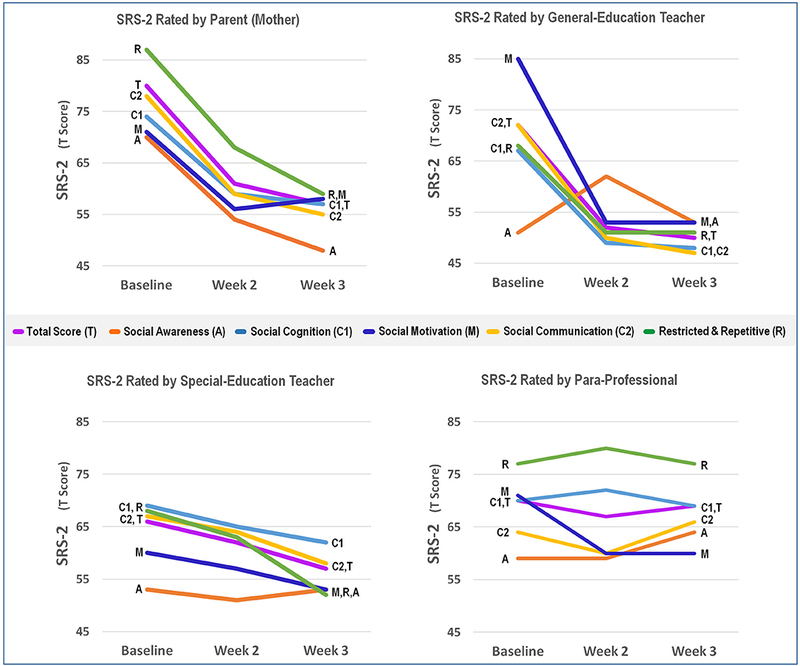 The student’s parent (mother), special educator teacher, and general education teacher, reported an improvement in the SRS-2 global scale in addition to improvement in social communication, social cognition, social motivation, and restricted interests and repetitive behavior subscales. The paraprofessional, who only provided a single intervention, did not note any substantial change in the SRS-2 total score. Our findings have a number of implications and limitations, adding to the current literature in several important ways. Firstly, it was evident that a wide variety of school educators were able to use this smartglasses intervention with the student, despite this being their first experience with smartglasses. The school educators were keen to support the student’s social communication needs through technology. Secondly, the educators were able to use this technology in the school setting, and specifically within the same classroom that the child would otherwise be attending. Compared to a research setting, this dynamic classroom/school environment poses considerably more sensory, social, physical, and organizational challenges. Finally, the successful and timely completion of all 16 intervention sessions of Face2Facedemonstrates that this is a practical and usable technology in this setting. At no time were any issues of usability or negative effects with the use of Face2Face noted, and lack of adverse effects have been previously reported in a larger population (Sahin et al., 2018). As with any intervention, there is always a possibility of a placebo effect. The smartglasses provide a game-like experience that augments a person’s normal perceptual experience. It is possible that such a novel experience is particularly prone to a placebo effect on the student, as well as the raters. On the other hand, people with ASD struggle with new experiences, and may also demonstrate extreme reactions to experiences that are difficult to their normal schedule, or that incorporate novel sensory stimuli (American Psychiatric Association, 2013). It was therefore reassuring that over 16 sessions, this digital perceptual experience did not result in these well-documented ASD-related adverse behaviors such as tantrums and/or meltdowns. In future studies, we intend to broaden the scope of our target population to include students with other cognitive-based learning disabilities. While measuring the effectiveness of particular apps, we will also monitor the impact on overall quality of time-on-task for teachers and students. Social and behavioral issues often interfere with both a teacher’s ability to convey content and skill, and the students’ ability to receive and absorb that content and skill. If our intervention can increase attending and reduce behavioral distractions, it should also have a positive impact on the quantity and quality of time spent “on task” for both teachers and students. If this proves to be the case, we can begin to predict and plan for how much time “on task” will be required to move toward proficiency and mastery for each child in the classroom. Kolbe, T., Partridge, M., and O’Reilly, F. (2012). Time and Learning in Schools: A National Profile. National Center on Time & Learning. Shindorf, Z. (2016). Exploring Barriers to the Generalization of Social Skills Interventions for Children Diagnosed with ASD: A Qualitative Analysis of ‘Youth Engagement Through Intervention’. Graduate Student Theses, Dissertations, & Professional Papers. University of Montana.